I’m Paige Roberts and I’m really outstandingly good at two things, writing, and learning. That gets me into and out of a lot of trouble. I’m very much an autodidact and a polymath. I speak data science, data management, and business need with great fluency, and spend most of my days translating between them. My specialty is explaining complicated subjects in uncomplicated language. For the last six years, I’ve focused my attention on learning and teaching about Hadoop and various big data technologies. I started a new job at the tail end of 2019 working as the Open Source Relations Manager at Vertica. On the personal side, I am a total geek, and delighted to be one. 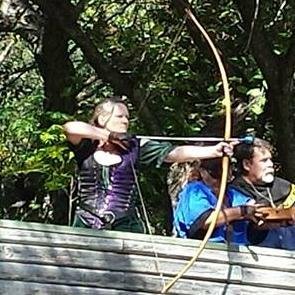 I’m into all those things “normal” folks tell you are un-cool like role-playing games, LARP’ing in the SCA, Doctor Who, superheroes, space exploration, comics, Tolkien, etc. I write and publish fantasy and science fiction stories under my maiden name Paige E. Ewing. (If you’re into that sort of thing, check out my author site: PaigeEwing.com or buy my books on Amazon.) I won the Kennedy Space Center’s global Space Apps Challenge three years ago for coming up with an idea for growing food on Mars. As my prize, I got to see the Orion EFT-1 launch with the NASA families. And I’m a pretty mean shot with a recurve, crossbow, or long bow. And a whole lot of other random stuff that comes in handy now and then. Too late, sorry. I finished up the project I was working on with Hortwonworks and accepted a full time position as Product Manager, Big Data with Syncsort as of January, 2016. – Update, 3 years later, I started at Vertica as Open Source Relations Manager. Syncsort is a great place with some very cool tech, but I was doing two jobs for most of those three years, and there is only so long you can burn the candle at both ends. On the plus side, I might actually get to update my blog occasionally. Follow me on Twitter as @RobertsPaige for my take on what’s interesting in big data and data management news, a tiny bit of snark and space geekery, and occasional event live tweets. I’m RobertsPaige on LinkedIn as well. If you are also proud to be a geek, or just like to learn random pop culture facts, challenge yourself with the #GeekTrivia game I run on Twitter as @PaigeEwing – Update on this. Since Twitter became a sucking vortex of despair for a while there, (thank you trollbots), I stopped running the #GeekTrivia game I’d been running for like ten years. I have plans, however, to restart it in another venue, and possibly set something to feed it back to Twitter automatically. Stay tuned. Feel free to ping me on Twitter under either handle, or just send me a message through here if you’d prefer.